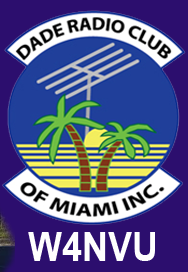 February 2012 Meeting Minutes – W4NVU – Dade Radio Club of Miami Inc.
Meeting was called to order at 19:48 with 24 present. Miguel presided over the meeting and welcomed everyone. The meeting was broadcast live on the air tonight from the EOC. Testing is being done in the other room. The microphone was passed around the room and everyone took turns and stated their name and call sign. Miguel welcomed everyone again. Miguel reminded everyone present tonight to sign in. Miguel advised that we had a Director’s meeting last month and the minutes were posted online. Miguel made a motion to accept the minutes, seconded by Frank. The motion passed and the minutes were approved. Corresponding Secretary – Virgil had nothing to report. Treasurer’s Report – Esther was not present tonight. Miguel has papers for her and he is also working on the Inventory list for the insurance. Website – Ryan is in the other room taking his test for General. Club Elmer/PIO Officer – Frank discussed name tags from the Goldcoast Club. He said that everyone has a name badge with their call sign so you know who everyone is. He showed one to those present. Merritt and others thought it was a great idea. It was discussed that it would be at “no charge” for any new paying member and $12.00 each for all regular members. It would be at cost. Business cards for Carl Herrera at MFJ Distributors were passed out. Club members will get 10% off anything in the catalogue and 12% off other items and we will not be charged shipping. Merritt suggested that we first need to settle on a design or logo and the ARRL logo, a set of colors and if the badge will be printed to etched. Frank and Miguel will research the prices and information and have it for us at the next meting. Merritt also suggest that that first time complementary members that actually renew their membership with us would get their badge as included in their first dues payment of $30.00. Instructor Armando Flores is not here tonight. We will get a report on the Tour de Cure and send an email thanking everyone. The Tour de Cure was discussed and a lot of members helped out. Dave came in and announced that Ryan passed his General. Congratulations Ryan!! 147.000 – Merritt said his is working on it. It is down right now and Merritt and John are rebuilding it. This repeater is current. 147.760 – Ray said its up and running and we are using it now. Ray said that we need to remove the extra antennas. He needs someone with a pick-up truck. Miguel is still looking for another sight and for the D-Star also. This repeater is current and expires 12/13/12. 224.200 – Robert is not here tonight. The repeater is down and it is believed that it has expired. The 1291.80 is also down. 51.660 – Ray stated that it is also down and expired. 444.200 – Carl is not here tonight. It is up and working per Merritt and it has been renewed and is current. The status of all repeaters was discussed and it was suggested that the club get involved in a 6 meter repeater. Emergency Committee – Carl is not here tonight. Miguel announced the Miami-Dade ARES/RACES and main net this month on 146.925. Miguel also discussed other club nets and meetings. Hamfest will take place February 1 and 2, 2013. Friday will be from 12:00 Noon to 9:00 PM and on Saturday it will start at 8 AM and go until 7 PM. The tear-down will also take place Saturday night. Tom is passing out business cards but we need to find a site and put the information on the website. Several possible sites were discussed: Tamiami Airport; Homestead Speedway (no roof if it is raining); German/American Club; Commerce Center (old Radisson Center); Hialeah Race Track; if anyone has any other ideas, please contact Tom. The ING Marathon was very successful and it was discussed that some of the procedures need to be updated. TDC Bike race was already discussed. Membership cards were discussed. Carl is working on hard cards and ID badges were already discussed. The D-star Repeater was already discussed too. The MS150 was discussed. It will take place April 21 and 22, 2012. We will be using VHF and UHF. Please contact darka500@aol.com – Matt Ginn KG4LGO is the head of volunteers. Ryan is setting up the website to automatically advise ARRL of our testing nights. More testing should be done on a regular basis. Tom Morris gave a very informative presentation on Solar Power and ham radio. We will put the presentation on the website. Ray suggested that if you are giving a presentation to provide a copy to Ryan prior to the meeting so that it can be posted on the website and those at home can follow along. It was very informative and educational. Thank you Tom. Miguel thanked everyone for coming. A Motion to close the meeting was made by Miguel, seconded by Joanne. Voted and passed. The DRC meeting was adjourned at 21:53.